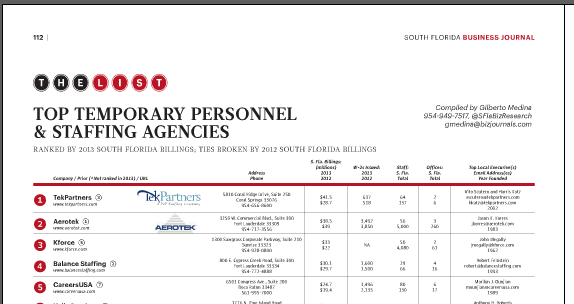 This week’s South Florida Business Journal featured the top Temporary Personnel & Staffing Agencies. While I can’t reprint the list for you, below is a sample. I don’t work for SFBJ but if you get a job from their lists then the subscription more than pays for itself. I am a huge proponent of using these agencies if you are stuck in a job rut. A lot of people have no idea that some of the best opportunities flow through them. My advice, apply to as many as possible and then whichever agency gets you a job first – WINS!